Written and Media by Emma Canady. The air is crisp and cold, the leaves orange and crunchy, and the drinks apple and pumpkin flavored. November is here and the pre-winter, fall atmosphere is thick on campus. While some people might consider November to be the month of Thanksgiving or deals for Christmas shopping, there’s one group of people that know the month as something entirely different: writers. 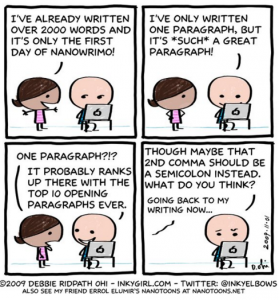 To writers, November means NANOWRIMO (or National Novel Writing Month). 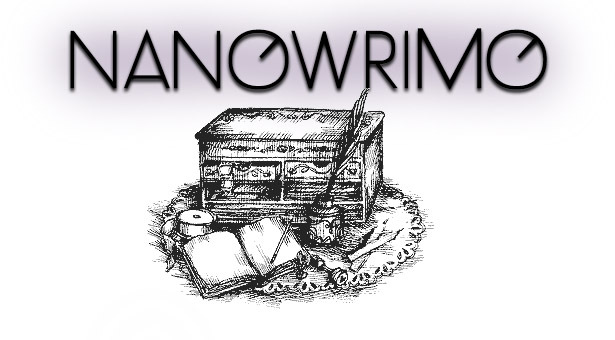 NANOWRIMO is that special time of year where writers hunch their shoulders, watch YouTube videos on preventative carpal tunnel exercises, and try desperately to write a full novel in one month. 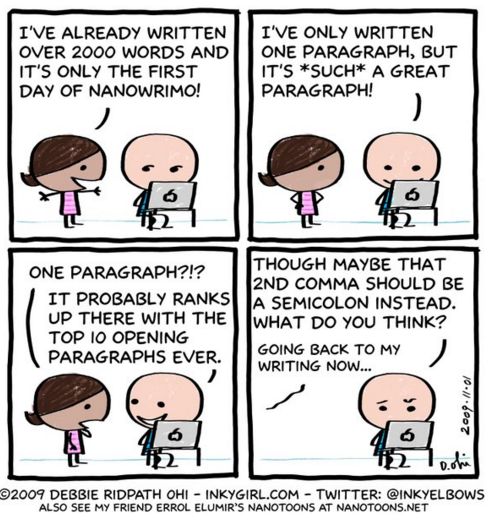 NANOWRIMO, for those of you who don’t know, is an annual tradition where would-be authors are challenged to write a whole novel in one month. Writers can sign up on the official website and post their progress. The goal is for writers to churn out 50,000 words in one month, with a daily goal of 1,667 words. Writers can go to meetups, talk to other writers, and generally just bond with people all over the nation while tearing up and typing. Even though we’re not even halfway through November, the internet is blowing up with people reaching out, laughing, complaining, and stretching their wrists. If you’re struggling with your NANOWRIMO or thinking about starting in on the fun, here are a few tips to keep you going! #1. There’s no wrong way to do it. Loads of young writers worry that they’re doing it wrong or that because they typed half a chapter in the line at Starbucks on their iPhone, it somehow makes their writing lesser. I’m here to tell you, that’s bologna. If you think Hemingway wouldn’t have written his entire repertoire on a tablet in the corner of a day bar, you are mistaken. Plath most definitely would have scrawled bits of her semi-autobiography in the tags of a mobile Tumblr post. #2. Don’t compare yourself to others. Yes, you’re probably not going to write Harry Potter your first go of it and almost certainly not in one month. But you can create something brilliant. No matter what your story is about or who the characters are, it’s special and important because you wrote it. No one else in the history of the world has had your exact thoughts and that alone is reason enough to write. Sometimes, what you write is going to be trash. Plain and simple garbage. There’s no real way around it. Even if the scene is perfectly laid out in your head and the rest of the chapter went amazingly, you are going to have days where every word sounds off and every mistake you could make, you do. It’s alright, though! Everyone has trash days. If someone claims to be a writer and says that they never have terrible days, they 100% are a pretentious jerk and you should nod politely before getting away from them. Write through the trash because on the other side is your inspiration and, maybe, your best scene yet. No one is born knowing how to write. Every person who claims to be a writer in their twenties almost certainly has a mile-high pile of manuscript corpses, buried out of sight and out of our subconscious. My first manuscript was written when I was eight about an orphan that jumped off of the building to escape doing homework. (None of it was good and all of it haunts me.) Writing is about pushing through the bad ideas; about knowing that your voice matters, even if the words don’t. If you want to be a writer, be one. Join in NANOWRIMO and write until you’re so emotionally involved with your characters you accidentally talk about them to your IRL friends. Write articles and submit them here to the Papyrus or your poetry to the Scriblerus. Just write.